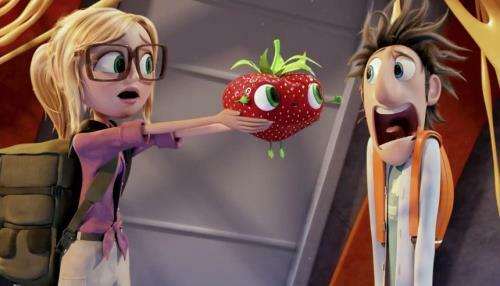 There’s more fun with food in the PG animated movie Cloudy With a Chance of Meatballs 2. Bill Hader (Turbo) and Anna Faris (What’s Your Number?) return to voice inventor Flint Lockwood and intrepid reporter Sam Sparks, respectively. This time around, Lockwood discovers that he didn’t actually destroy his machine in the original film. Instead, his invention is now creating animal-food hybrids, “foodimals!” Lockwood and his friends have to embark on a new adventure to save the world again, but this time from hungry tacodiles, shrimpanzees, hippotatomuses, cheesepiders and other foodimals. Also in the voice cast are James Caan (Thief), Andy Samberg (Celeste & Jesse Forever), Benjamin Bratt (Despicable Me 2), Terry Crews (The Expendables 2) and Neil Patrick Harris (A Very Harold & Kumar Christmas). The movie has a new direction team: Cody Cameron (Open Season 3) and first-time helmer Kris Pearn, who was head of story for the original Cloudy With a Chance of Meatballs. “Anatomy of a Foodimal” with the filmmakers discussing the inspiration behind the flamangos, cheesepiders, hippotatomuses and more. “Production Design: Back in the Kitchen” with Cody Cameron and Kris Pearn talking about how they came up with the stories and jokes for the film. “Awesome End Credits” about how the end credit sequence was created using a mix of 3D, 2D, stop motion and live action. “Cloudy Cafe: Who’s On the Menu?” with cast newcomers Will Forte (MacGruber) and Kristen Schaal (Dinner for Schmucks) talking about what drew them to the movie and how they discovered the voices of Chester V and Barb, as well as Terry Crews stepping into the size 12 shoes left by Mr. T to portray Officer Earl Devereaux, plus Anna Faris, Bill Hader and others. “Building the Foodimals” with animators discussing how they created the new creations. “The Sasquash” exploring all the places in the film where the Sasquash hides. “Delicious Production Design” with the animators talking about the movie’s design. “Super Manny” – Manny, the Jack of all trades, saves an adorable kitty with his many skills. “Earl Scouts” – The Foodimals join Earl’s scouting program but are very competitive. All versions also offer a downloadable digital copy of the movie via UltraViolet.